Hi guys. 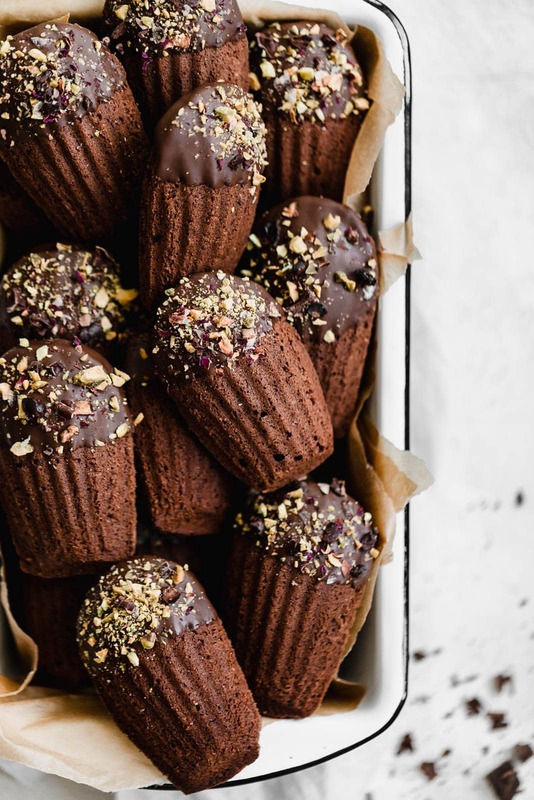 Today, we’re doing chocolate-dipped chocolate madeleines. They’re almost too pretty to eat! But only almost, because they’re also too good NOT to eat 🙂 What are chocolate-dipped madeleine cookies, you ask? Well, technically madeleine cookies aren’t actually cookies. They’re actually French butter cakes! Madeleines are slightly crisp on the outside and insanely spongy and soft on the inside. They’re made in a special pan to achieve those lovely scalloped edges and pair perfectly with a steaming mug of tea or coffee. 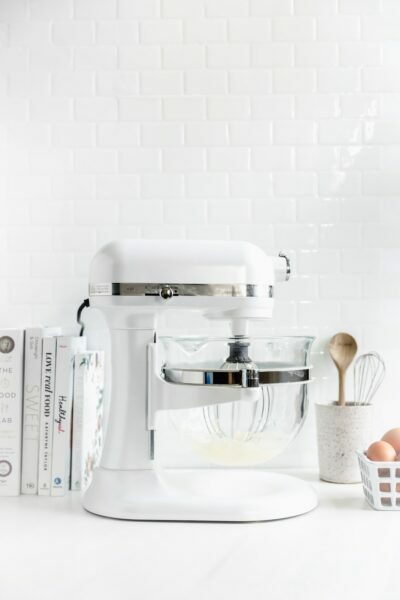 Prepare the madeleine pans — Before you begin making the cookie batter, you first need to brush the wells in the madeleine pan with butter. Once the butter’s been brushed on, freeze the pan until the butter hardens. Repeat this one more time, then keep the pan in the freezer while you make the cookie batter. Make the cookie batter — Beat the butter and sugar in a standing mixer until light and fluffy. Then add the eggs, vanilla, and salt, and continue mixing until combined. Add the dry ingredients to the wet in increments, mixing until everything is just combined (you do not want to over mix the batter!). Fold the melted bittersweet chocolate in by hand. Chill the cookie batter — Remove the buttered pans from the freezer and spoon the batter into each well until all are fully filled. Smooth the tops of the batter with the back of a spoon, then pop the pans back into the freezer to chill the cookie batter (this will take around 15 minutes). Bake the cookies — Bake the cookies until they’ve risen and are just set. Be careful not to over bake the chocolate madeleines, as that will ruin their texture. Dip the cookies in ganache — Once the chocolate madeleines have cooled on a wire rack, prep the chocolate ganache and dip the rounded edge of each cookie into it. Lay the chocolate-dipped chocolate madeleines back onto the wire rack and allow the chocolate to fully harden before serving. Freeze the baking trays — The reason you freeze the buttered madeleine pans is to ensure that they puff up fully in the oven and develop that beautiful scalloped edge. If you don’t freeze the pans, the texture of the cookies should turn out fine, but they won’t look as polished. 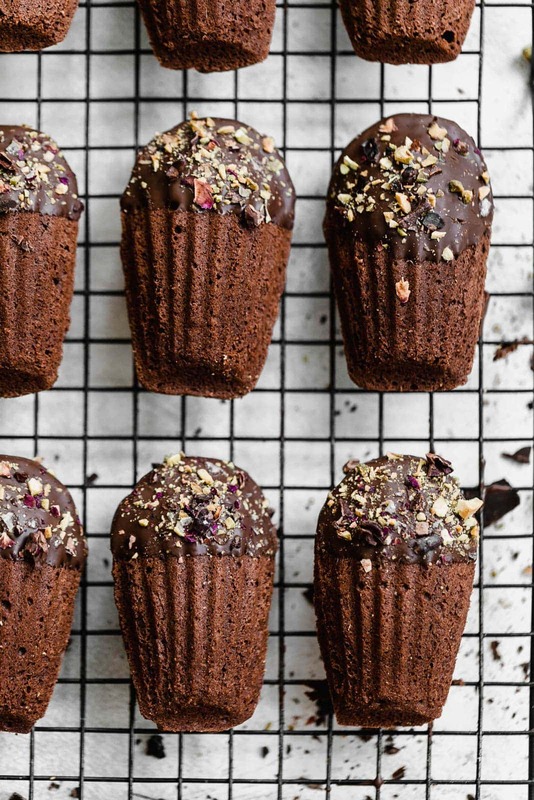 Use a legit madeleine pan — Unfortunately, there are no shortcuts when making chocolate madeleines. You simply must bake these cookies in the correct pan, otherwise you’re not making actual madeleines. 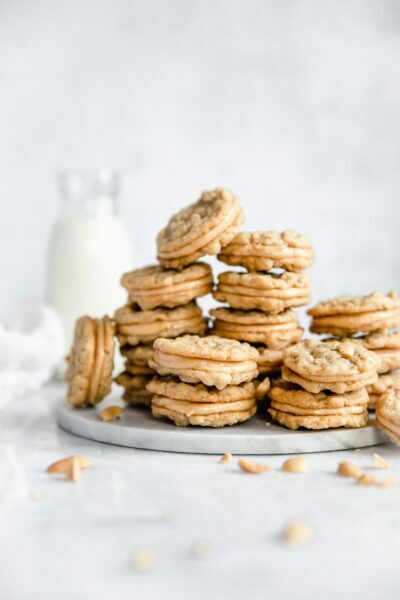 Sift the dry ingredients — To ensure that these cookies come out light and airy, you absolutely must sift the dry ingredients before adding them to the wet batter. You don’t want any clumps of flour or cocoa powder sneaking into the cookie batter! Make no substitutions — This is one of the few recipes that you really can’t get away with substitutions. Unsalted butter can’t be swapped for salted, table salt can’t be used in place of kosher, and so on. 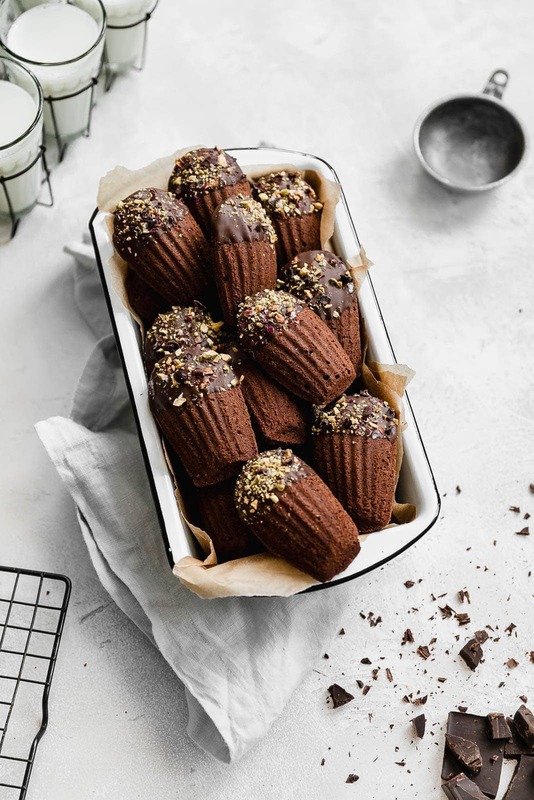 Apologies, but these chocolate madeleines can be a little finicky! 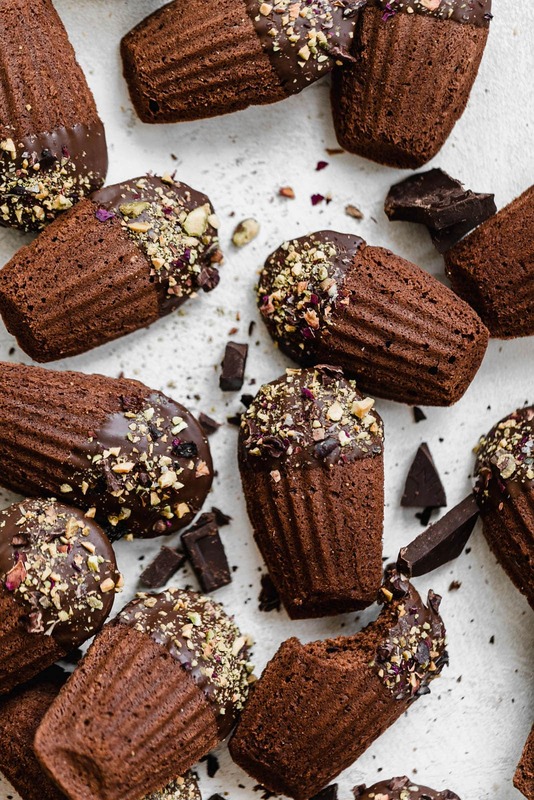 Keep these chocolate-dipped chocolate madeleines in an air-tight container on your counter for 2 to 3 days. After a couple of days, madeleine cookies tend to go a bit stale and they lose their crispness. 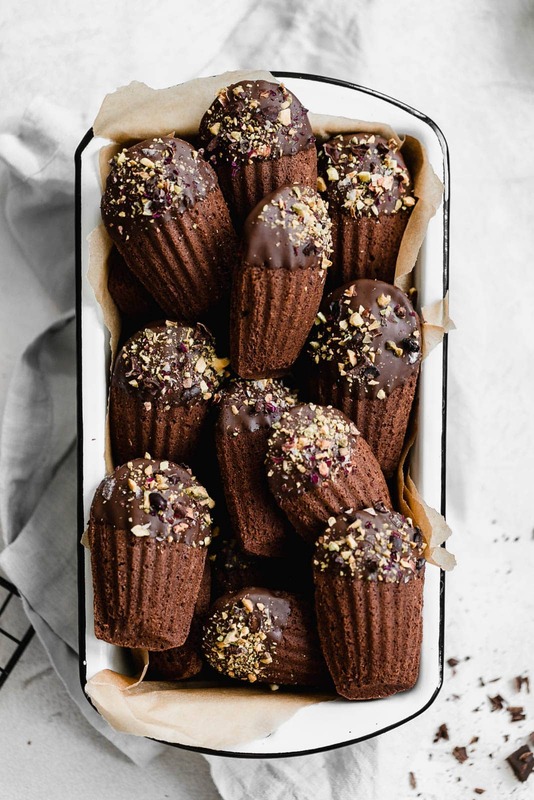 So if you’re planning on making a batch of chocolate-dipped madeleines for guests, I’d suggest making them the day of so your guests can enjoy them fresh! So short post today. Life has been a bit hectic as of late. 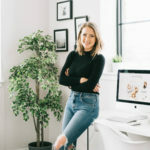 I’m not ready to talk about it right now, but it’s why I’ve been a bit sporadic with the blog for the last month. 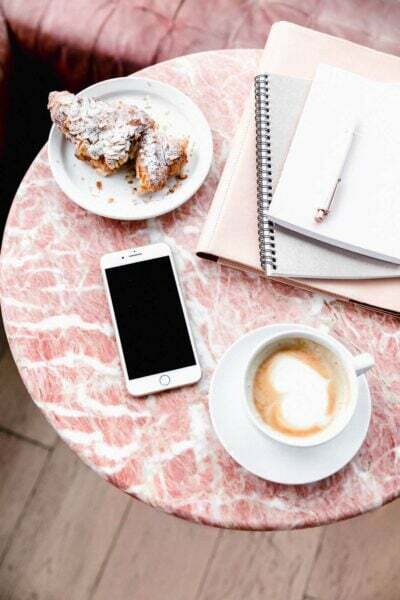 Just know I’m here, still cranking out recipes slowly but surely <3 XO. I was originally hired to photograph this recipe for Sur La Table. But I just had to share it with you all! All text and opinions are 100% my own. Thank you for continuing to support the brands that help make Broma possible! Hi, Sarah. I love these madeleines. They look delicious and are so cute too! I also love this wood board you used. Is it from WoodvilleWorkshop? If so do you mind sharing the name of it? Thanks. These are so perfect, even with the flu I want a few of these! Um, how gorgeous are these?! Happy Love Day! Such beautiful cookies! Lovely photos, too!